It’s time to catch some cobia!! The rules have changed this year so beware. The limit is now 1 fish instead of 2 fish per person but the length is still 33″. Also, keeper season ends on June 20 compared to an open season before. That doesn’t mean we can’t keep catching them, it just means we have to let a few go. The water around Morehead City is 68F which is the magic temperature for the bite to start. Plus, the menhaden bait balls are in place. Mother’s Day is usually the de facto start of the bite and I will begin running trips on May 14. Capt. Eric Ciocher and the Ultimate Catch TV Show were in the area last week filming a show for the 2016 season for The World Fishing Network. When Eric arrived on Monday, we had small craft advisories. A few days later when he left, we had small craft advisories. In between we fought high winds and rain but we still managed to catch enough fish for the show. 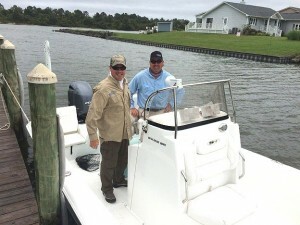 During the filming we caught flounder, trout, redfish, stripers and bass. Eric and his cameraman love the area and want to come back again. Maybe we can provide them some Carolina blue skies next time. When I was a little boy, I can vividly remember my dad taking me bream fishing at a pond on my grandmother’s farm. I remember where I sat on the bank. I remember the rod I used and I remember the bait I used. And I remember my dad telling me to quit talking because I would scare away the fish. Many years later, I am still fishing and I have no plans to stop. This past weekend another dad took his #1 fishing partner with him looking for Old Drum on the Neuse. Congratulations #1 for your first Old Drum. I wonder who hooked who on this trip. And congratulations dad for making a memory that neither of you will ever forget. Looks like this apple didn’t fall far from the tree. The Old Drum have arrived with many catches being reported this past weekend. They should be here through September so get out and make a memory and….. 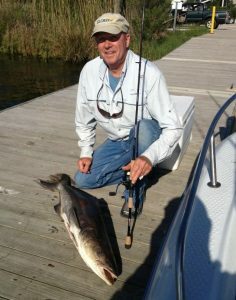 The bait started showing up around Memorial Day which meant that the larger redfish would soon arrive. June was a little slow but July has started off great! In the morning hours the reds chase the bait onto the shoals of the river and bays to feed. This is an excellent time to target puppy drum, slots, and over slots as they become easier to catch in the shallower waters. The legal slot size is 18” – 27” with a creel limit of one per day per angler. This 34” guy was above the slot size so we couldn’t keep it, but it will make for a good fishing story. Tarpons are the largest game fish that Oriental has to offer fisherman and they usually start arriving into the sound and river mid-to-late June. These monsters range between 75 lbs. to 200 lbs. 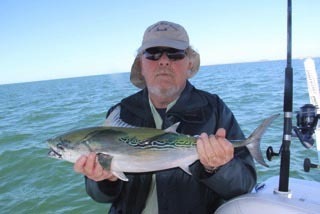 and pose quite a challenge to the angler with the skills to find and land them. Once they show, they will usually stay through mid-September. When the water salinity is high, they can be found from the sound to near New Bern. Years that the water salinity is low, they tend to stay more downriver to the sound. Who knows what 2015 will bring. 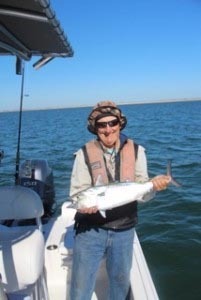 The first tarpon was caught on Thursday. Congratulations to Phil Ambler’s boat for landing the first tarpon of the year. Hopefully, this is just the beginning to a great season.